 Xia P, Gou W F, Zhao S, et al. Crizotinib may be used in lewis lung carcinoma: A novel use for crizotinib[J]. Oncology reports, 2013, 30(1): 139-148. 1. Increased oral availability and brain accumulation of the ALK inhibitor crizotinib by coadministration of the P-glycoprotein (ABCB1) and breast cancer resistance protein (ABCG2) inhibitor elacridar. Int J Cancer. 2014 Mar 15;134(6):1484-94. doi: 10.1002/ijc.28475. Epub 2013 Oct 3. 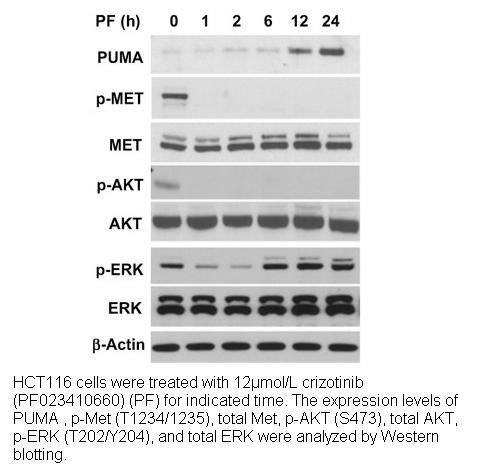 Crizotinib concentrations in plasma and brain are regulated by Abcb1 only if a non-saturating dose is applied. The co-administration of elacridar and crizotinib not only substantially increases crizotinib concentrations in plasma and brain but also promotes the delivery of crizotinib to the brain. 2. Clinical benefit of continuing ALK inhibition with crizotinib beyond initial disease progression in patients with advanced ALK-positive NSCLC. Ann Oncol. 2014 Feb;25(2):415-22. doi: 10.1093/annonc/mdt572. Crizotinib, a drug approved for the treatment of ALK-positive NSCLC, has been investigated for its clinical benefits in crizotinib-treated patients who have developed PD. 3. Dual ALK and EGFR inhibition targets a mechanism of acquired resistance to the tyrosine kinase inhibitor crizotinib in ALK rearranged lung cancer. Lung Cancer. 2014 Jan;83(1):37-43. doi: 10.1016/j.lungcan.2013.09.019. Epub 2013 Oct 14. 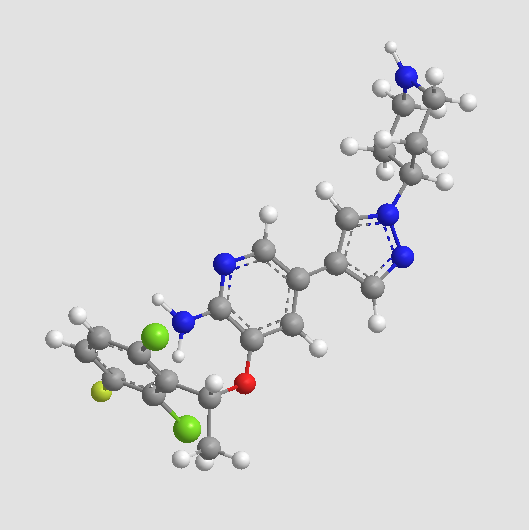 Crizotinib is a TKI with anticancer activity against ALK translocated NSCLC. 4. 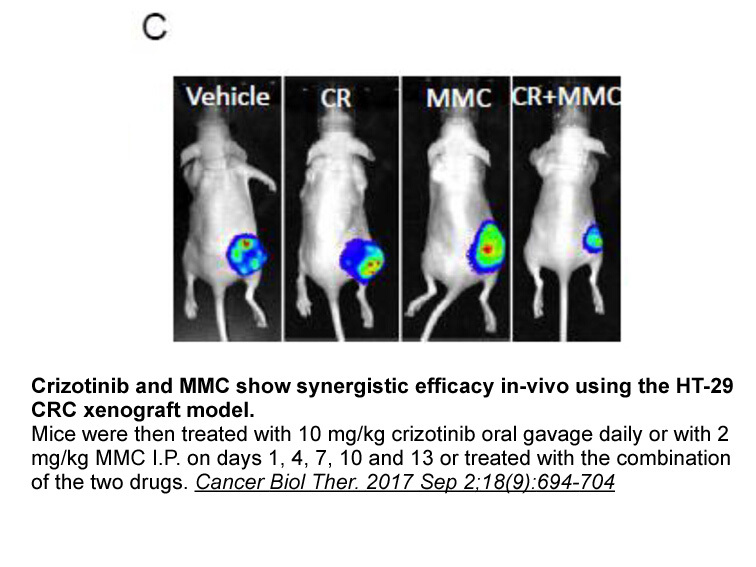 Crizotinib may be used in Lewis lung carcinoma: a novel use for crizotinib. Oncol Rep. 2013 Jul;30(1):139-48. doi: 10.3892/or.2013.2424. Epub 2013 Apr 24. 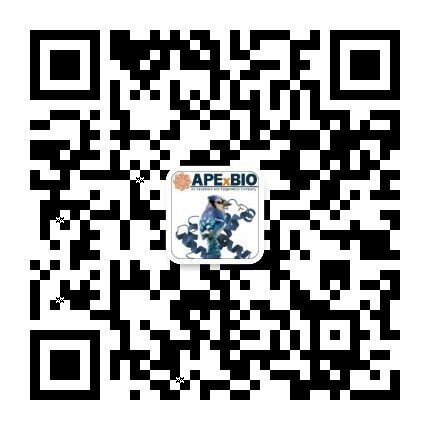 Crizotinib is an inhibitor of ALK that has been approved by FDA for the treatment of locally advanced or metastatic ALK-positive NSCLC. 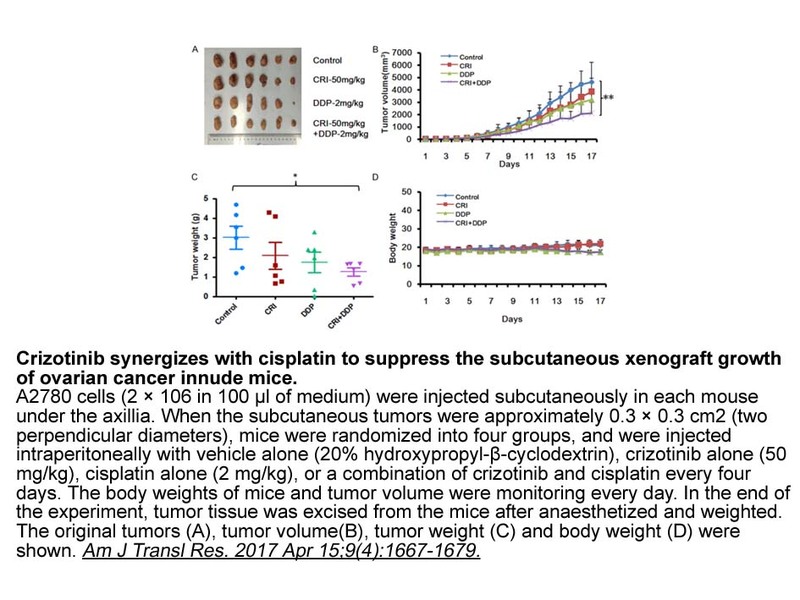 Crizotinib also exhibited antitumor activity in LLC cell lines, where it induced apoptosis and G1 phase arrest in LLC MP cells; inhibited cell proliferation in LLC SP cells; suppressed tumor growth and angiogenesis in established xenografted tumors; and activated the Smad signaling pathway. The renal side effects of crizotinib have yet to be investigated. Zou HY1,?Li Q,?Lee JH,?Arango ME,?McDonnell SR,?Yamazaki S,?Koudriakova TB,?Alton G,?Cui JJ,?Kung PP,?Nambu MD,?Los G,?Bender SL,Mroczkowski B,?Christensen JG. 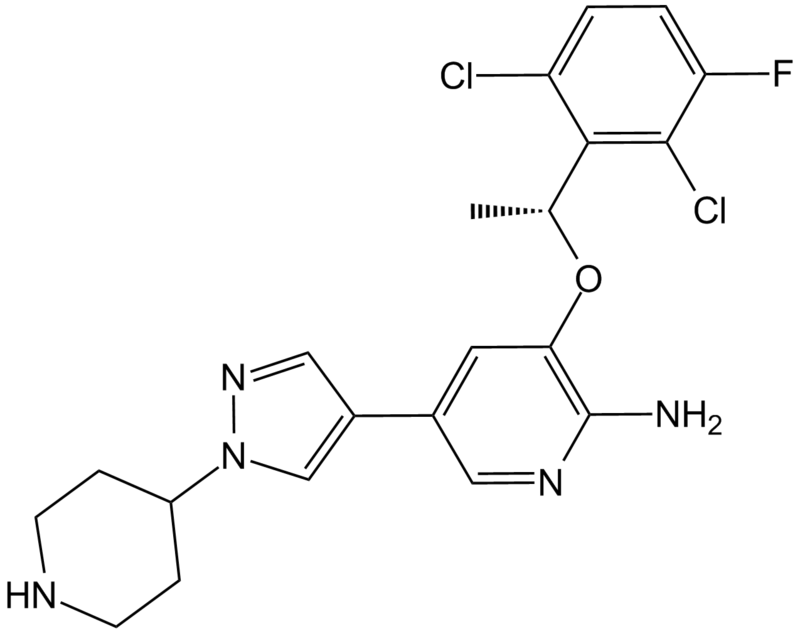 An orally available small-molecule inhibitor of c-Met, PF-2341066, exhibits cytoreductive antitumor efficacy through antiproliferative and antiangiogenic mechanisms. Cancer Res. ?2007 May 1;67(9):4408-17.